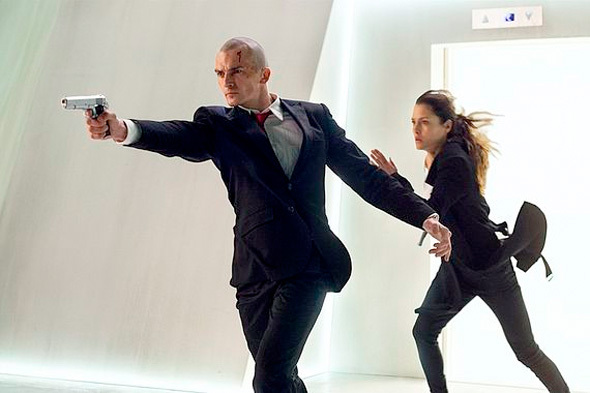 Later today we'll get to see some footage from 20th Century Fox's franchise sequel Hitman: Agent 47 during the studio's Comic-Con panel in Hall H. This time it's not Timothy Olyphant in the role, but rather Rupert Friend as the bald, genetically engineered assassin from the video game series of the same name. There are no story details just yet, but we do have some first look photos of Friend in action with co-star Hannah Ware as Katia van Dees. But as of now, no sign of Zachary Quinto in the film. We're not excited about the film yet, especially with a February 2015 release, but maybe some good footage can convince us. 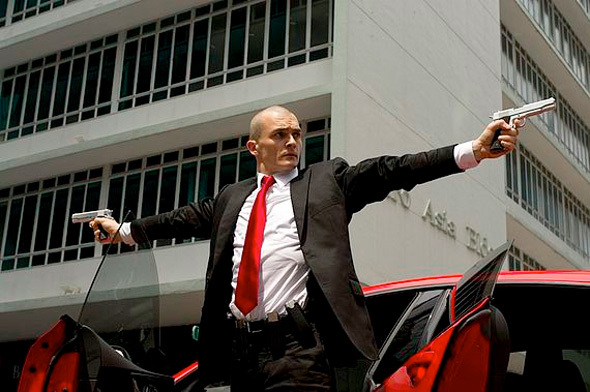 Hitman: Agent 47 is directed by Aleksander Bach, making his feature directorial debut with a script from Kyle Ward (Machete Kills), Skip Woods (The A-Team) and Michael Finch (Predators). Based on the top-selling, award-winning videogame franchise, the sequel follows an elite and genetically engineered assassin, known only by the last two digits – 47 – from a barcode tattooed on the back of his neck. Rupert Friend takes the title role in the film that also stars Hannah Ware, Zachary Quinto, Ciaran Hinds, and Thomas Kretschmann. 20th Century Fox releases the film early next year on February 27th, 2015. Well? The first Hitman film was amazing, shame it didn't do so well they had to reboot. I don't understand the hate for it, it had great action, excellent direction, and a fantastic script. It's a video game movie and they did well for what it was. Well am looking foward to this one anyways and I'm glad Skip Woods is also back in the writers chair (A Good Day to Die Hard was simply amazing and the best and only entertaining Die Hard movie imo). I feel like you are trolling Hard with that comment.. I was let down by the original movie. I played the first three games quite a bit and really liked the character and thought someone could make a really good, atmospheric movie like the beginning sequence in The Professional, where he hides in the shadows and silently kills his targets. The first movie was far too loud and overblown for Hitman. From the pictures of this one, all I can say is at least the guy looks more like 47 than Timothy Olyphant. It's unfortunate I really liked Timothy Olyphant in the original. This is going to be a straight to DVD reboot. Wonder when they are gonna reboot this reboot cause this will not be any good. Im sure of it. Rupert Friend doesnt look the part. He should be bald, a little bit older and have much more muscles. This is just stupid.